This function allows the users to generate report showing the school incidents logs with all status. The report will also display student offence history. Select Query Name From the Search By drop-down menu. Enter MOE_DI_DSCRPT in the Begins with field. Entered query name will be shown. Search for the required query name and click on the HTML link. You will be directed to MOE_DI_DSCRPT page. Select or Enter the values in the Start Date, End Date and Campus fields. User can only prompt for their own school code. Query will not return any value if user try to prompt for other school. Click on the View Result button. 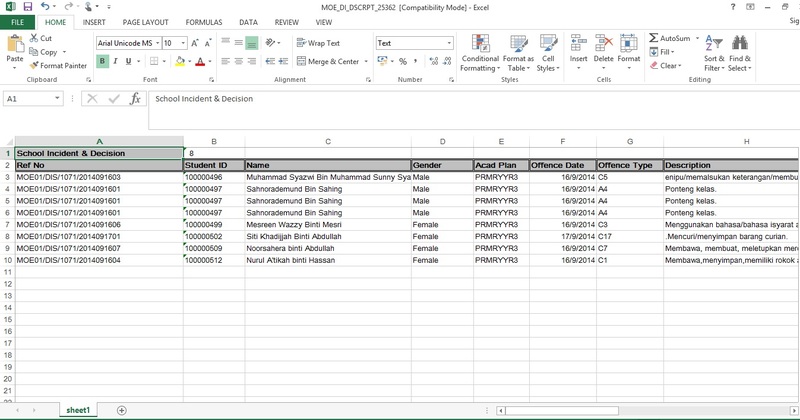 The report will show incident logs with all statuses between specified start date and end date as well as displaying student offence history under specified school only. Click on the Excel Spreadsheet link. View the result of the report in excel format.